Credit card fraud is a serious problem that can happen to any card holder at any time. Hundreds of millions of dollars are lost to credit card scams each year, according to the Federal Trade Commission. Use the following eight tips to help protect yourself from becoming a victim of fraud. No one expects to be the victim of a credit card scam. But it's better to make a few changes in your behavior now than to have to deal with the consequences of identity theft. Guard your credit cards. Keep credit cards in places that are hard for anyone else to reach without you noticing. You may also try keeping your cards in unexpected places. Instead of carrying credit cards in your wallet, for example, consider placing them in a separate small pouch or business card holder. Keep good records. Have your credit card account numbers, expiration dates, and credit card company customer service numbers at home, separate from where you keep your cards. An easy way to do this is to make a photocopy of the front and back of your cards. You'll need to access this information quickly if your credit cards get stolen. Never lend your cards to anyone or leave them lying around in the open. It only takes a few seconds for sticky fingers to pocket your credit cards. Read through credit card statements promptly to make sure all charges are correct. Save your receipts to compare the amounts with charges listed on the statement. 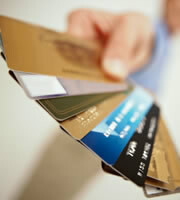 Keep an eye on your credit card when paying for items. Your card can be quickly swiped--and the information on it stolen--when you make a purchase. This can be a particular problem if the transaction is happening out of your eyesight. Pay in cash at restaurants to avoid having the waiter walk away with your card. Never give out your credit card information in response to a solicitation. Be very wary of people or companies who contact you via unsolicited emails or phone calls. Reputable credit card companies will not ask you to email sensitive account information. Shred statements and promotional mailings from card companies. Those offers for balance transfer credit cards may seem like junk mail, but identity thieves routinely pick through trash to look for credit card applications and personal information they can use. Contact your credit card company immediately if you see a strange charge on your statement or lose a credit card. Use online statements to keep track of your account activity between billings. What happens if, despite your best efforts, your credit card number is stolen? After you contact your credit card issuers, you may have to sign a statement that you did not make the questionable charges. You also may need to file a report with the local police. Once you report the theft, you won't be responsible for additional fraudulent charges. However, you may be liable for $50 of the stolen charges under federal law. You may also consider placing a fraud alert on your credit report. 0 Responses to "Eight Ways to Guard Against Credit Card Fraud"